The Starbucks card app for Android phone payment arrived today. It doesn’t take long to download the app. Once it is installed, it is right there listed with all your apps. 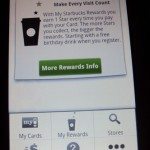 If you already have a StarbucksCard.com account, just sign in and your cards will automatically be imported to your phone. I had one funny error message pop up when my cards were being imported: I have one card registered which was a gift from a reader in Canada. The app sees that as an international card, and will not import it. 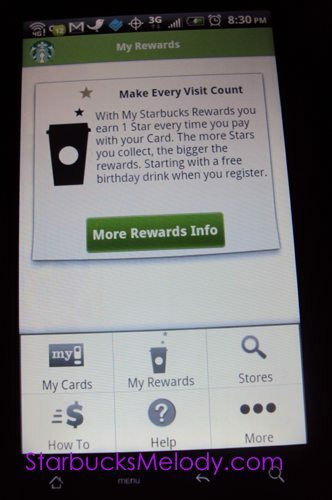 My favorite little features are the descriptions of My Starbucks Rewards, under the “menu” area of the app. 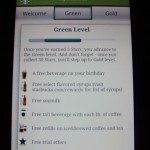 Click on “Menu” on your phone, and then click on “My Rewards,” and then when you click on “More Info,” you’ll see a description of the three levels of My Starbucks Rewards. So there you have it! There are more features on the app, but this is what caught my eye. I know that I am really late to the game when it comes to mobile payment. There has been an unofficial Android app for a long time but I’ve never downloaded it or used it. Somehow I thought that I would never join the crowd of paying for my drink with my phone, but I might have to eat my words now. Sorry the photos are so horrible. I just snapped a few pics of my own phone. There are a few official Starbucks pics out there for use by media, but I thought it would be much more fun to use my own phone. So do tell, are my readers using this app? Just as a reminder, during this year’s annual meeting of shareholders, Annie Young-Scrivner mentioned that Starbucks hopes to eventually allow people to earn “stars” at their local grocery store for qualifying Starbucks grocery items. It seems like we’re probably a long long ways from that still, but launching apps with a variety of features is probably a step in the right direction. Message for Starbucks: Allow Store Partners to Wear PRIDE t-shirts any time during PRIDE month. I’ve been using the Starbucks iPhone app since it was first released – It’s impressive! I’m a bit surprised with the technology they decided to leverage (bar codes requiring expensive scanners), but the app works well! From the perspective of a software development guy, I’m most impressed with how fast the payment transaction is, and the application has never crashed on me. It still has some quirks, and there are some features missing (IMHO! ), but I’m glad they spent time to bring it to Android. Pretty cool! Just ordered my android today, so I’ll have to check it out! Melody, your Seattle card needs reload? Haha. 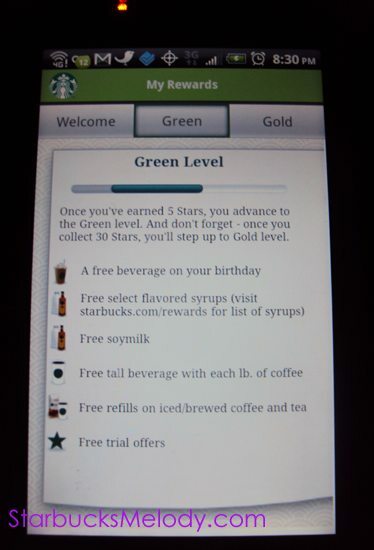 Starbucks mobile applications are very convenient systems. I too downloaded the app for my Android even though I had been using the unofficial Android app prior. I have yet to use either for payment. Generally I leave my phone in the car when I go into Starbucks and prefer to still use my mini-card which is attached to my keychain. The convenience of being able to reload my card from both apps is a plus, as several times I have let my balance run low and have forgotten to reload my card on my computer. I do feel a bit more secure now reloading using the official app rather than using a third party, but they both work. The ability to see my stars on my phone now is a plus with the official app, however, the history function is conspicuously missing (or have I somehow missed that feature), which the unofficial app did have. It works and you broke it down very nicely in your post, Melody. Ok I guess I am in the stone age, but I don’t have a phone that can use apps and although I see the benefit of it, I wish SB would expand somehow with other options for people that do not use apps. alot of good clear info Melody. However, I’m also ‘in the stone age’, and likely will stay there for awhile!!! But, I know lots of (mostly younger than me) people almost live off their phones…. the app does take a lot more space than the unofficial version. the unofficial version also makes you enter each card by hand. i only ever entered my main card into it. you also have to manually reload with the unofficial version. 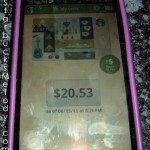 the app allows me to transfer between cards, just like the website! the website itself doesn’t even allow me to sign in on my phone anymore, so this is fab. the app (as far as i know, haven’t tried it yet) will let me autoload easier. Pretty cool! Someday I’ll have a smartphone that I can do this on, too. It’s amazing how far we’ve come in such a short time. My youngest son was born nearly 19 yrs ago and we didn’t even have a computer in out house — now we carry them in our pockets! I hope they’re working on a blackberry app now that they’ve got the iphone and the android looked after! Melody – I see you whited something out. What is it? I mean, obviously not the specifics but generally? I have been using My Coffee Card Pro. (I really like the Android Siren. 😉 ) My Coffee Card Pro is polished, fast, uses minimal resources, and does what I need. One of the few apps that I do not regret paying for. I’ll give the “official” Starbucks App a test and evaluation. I was oh, so wrong when I said the recent transactions feature was missing in the Android app. It’s there, if you hard press your card balance you will see it along with several other features. Thumbs up, Starbucks. @Michelle – Sorry it took so long to get back to you. On that screen, the full card number of the card appears. Although the odds of anything happening are small, I thought it would be best to white out all my card numbers rather than showing them here. I’m actually more of a fan of the My Coffee Card app. One of the first apps I downloaded for my new Droid two weeks ago (first smartphone). Besides apparently being less space, it has a really nice widget, which shows your balance, stars needed, and “Click To Pay” barcode straight away on the mainscreen. I noticed that the official app didn’t have this. Paying by phone has been pretty cool, though I’ve oft been anxious to scan it before the baristas click to enable the scanner. Thanks for the info on how to view my transaction history! I am thrilled this app is OFFICIALLY here and love using it! @Spenser – I almost feel like I should take a look at the unofficial app. Is there any reason why I can’t run both of them on my phone? And despite that I’ve got this, I still feel like it’s easy to hand a barista an actual card. And which is faster if you’re asking for a panani to be rung up separately from a drink? Too many thoughts! Molly, I know what you mean. I feel like I’m living in the era of “Star Trek: The Next Generation.” Beam me up to Starbucks Scotty! I got this for the iPhone already since it has been launched…it is a great app! But they should make it international! Anthony. Well look at that. Thank you. Now that you mention it, I think I remember it being released but because I’m in Canada, I couldn’t download it. I should look again and see if they’ve changed that. For those of you that downloaded the app yesterday, or before, there is already an update to v1.0.1. I recommend you go for it. The developer must have realized that they did not compile the app, that is the reason you are seeing complaints about size and slowness. The new version knocks off a couple of MBs. There were also reports of problems running on Samsung Galaxy S/Vibrant. That is the smartphone I have and have not experienced problems (yet, knock on wood 😉 ). Looks like Starbucks has a good app and has added features that folks want. I consider it pretty complete for a version one. One thing I did notice today, My Coffee Card Pro is running real slow and causes some force close. IMHO, Starbucks has made their site unfriendly to My Coffee Card — not a smart business move. 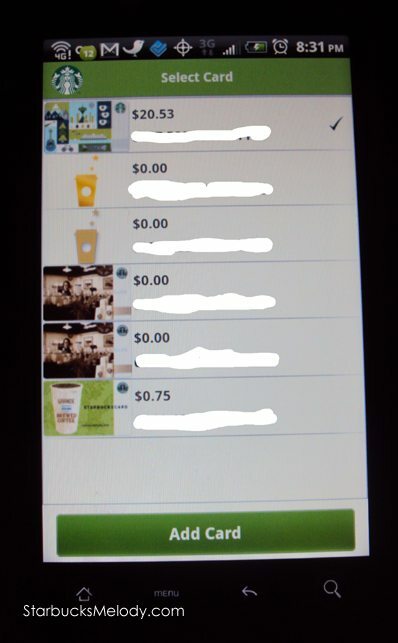 I don’t have an android or an iphone but installed the apple app on my son’s little ipod touch so that he could go to Starbucks with his friends and have a way to pay. One day recently I drove to Starbucks, ordered and realized I did not have my wallet or a dime on me. My son pulled out his iPad and opened up the app and we paid using that big giant screen and the bar code scanner. It was kind of funny and awkward, but I was happy we had a way to pay! @denise r – don’t feel too bad about not having a smart phone, I don’t even have a personal cell phone. I never have had one. @ChrisW – Eek. I should’ve thought of that. Come to think of it, I remember the sales person telling me something like that when I got the phone. Oh well! Thanks for the tip. 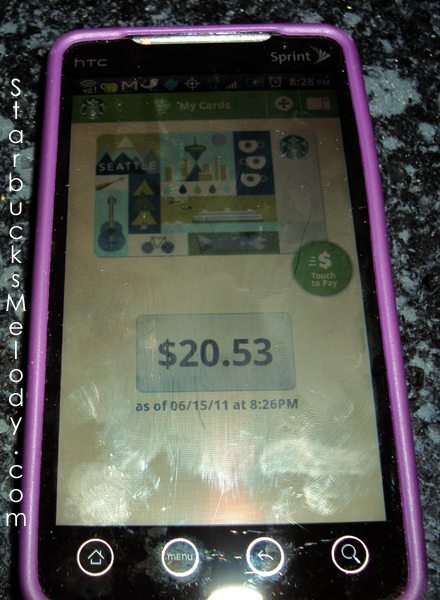 I visit Starbucks several times a month – an app like this helps me keep track of how much I spend there on tea and baked goods and with the increasing ownership of android phones, other companies like this will come out with similar apps soon, too. It was brought to my attention today by SEVERAL customers that information about store locations and hours are incorrect on the mobile app. In fact, a location still pops up for a store that was closed LONG before the app was launched. I’m about to cross check the actual Starbucks website to see if it is also incorrect. I was very surprised at the inaccuracy on important customer information like that on the mobile app. In fact – both store hours and store locations are correct on the actual Starbucks website. How odd that the Mobile app is not up to date. Has anyone else noticed this issue? @BCav – I have the Android app on my phone, and I didn’t even realize that there are store hours in it. 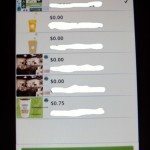 I don’t use the app all that much, though it has saved me a couple of times when I have forgotten my wallet at Starbucks, and it is time to pay! I had an interesting discussion with a fabulous partner about the “QSR” codes (that funny black & white square box) on products. The new whole bean coffees have a QSR box on them. Apparently the iphone app has some sort of QSR reader, but the Android one does not. That might be a nice thing to add to the app. I use the Android App daily to pay for my Starbucks addiction, but have to confess that I have not stress tested its other “features”. BCav’s comment is just another confirmation of my observations that Starbucks, corporate organization, is not working as a team. As I have commented before, their left hand has no clue what the right is doing. Starbuck’s appearing to react promptly to the free tall reward with a 1# (8oz Reserve) Bean purchase does not mean that Starbucks gets it. I find it inexcusable that information in the Apps is wrong and that there also continues to be problems with the iPhone App’s latest revision. Attention to detail is important from the CEO to the newest Partner. Part of the detail is understanding how action in one area will affect a number of seemingly unrelated area (the law of unintended consequences).